For a special dining experience, go to aptly-named "Azure Restaurant", which has been named as "Hawaii's best new restaurant." 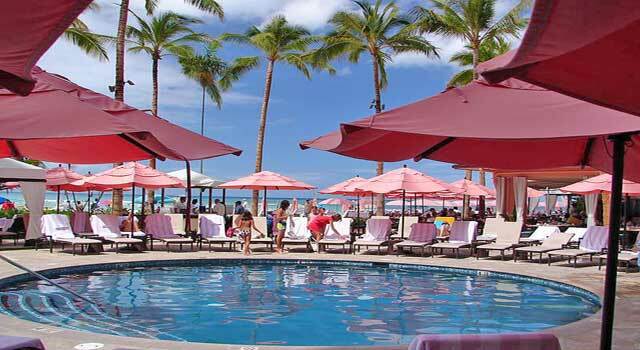 It's right on Waikiki Beach at The Royal Hawaiian. Chef "Jon Matsubara" is New York-trained and his signature dishes are outstanding. This seafood restaurant near Waikiki Beach is the freshest in Hawaii, sourced daily from the famous Honolulu fish auction, which starts at 5.30am with the ringing of a brass bell. This Hawaiian fish auction is the only one of its kind from Tokyo all the way across America to Maine. 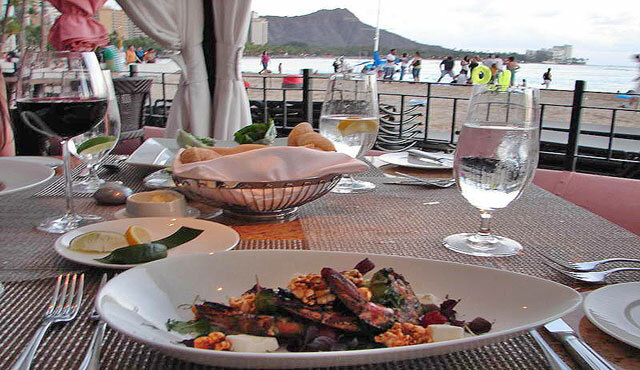 Dinner at Azure restaurant is served with a classic Pacific ocean view on the edge of the sandy beach. 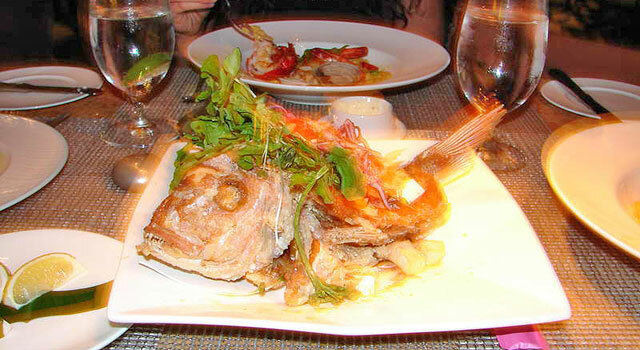 Try the flame-roasted catch of the day, or the crispy whole fresh fish that looks whole, but remarkably is de-boned first. The delicious hibachi prawns include spiced popcorn feta and Thai basil. The Hawaiian ahi here is the finest sashimi World's Best Holidays has tasted in many travels. Meat dishes at Azure are also superb; try chef Jon's Australian wagyu beef fillet with foie gras for $29 or the braised lamb shank osso bucco for $36. The Azure dessert is also not to be missed; it's hard to choose, but here goes...the roasted Maui pineapple and white chocolate mousse in caramelised dark rum and vanilla bean sauce is memorable at $11. The service and wine list at this restaurant are superb. Another highly-ranked restaurant near hotels on Waikiki Beach is the "Cheesecake Factory", with a huge menu that many chefs work hard at making tasty despite the high volume of meals. No bookings here - the tip is to get to this restaurant on Kalakaua Avenue by 5.30pm to avoid big queues that sometimes extend till 10pm. On the other side of Kalakaua Ave near accommodation on the beach is Jimmy Buffett's Margaritaville, inexpensive casual dining that's a visual overload of beachy music memorabilia and even a bar area with waterfalls running under your feet. If you're a seasoned music lover, the big TV screens play Jimmy Buffett's greatest hits interspersed with other music to entertain the non-Buffett fans. Nearby on the Waikiki Beach Walk on "Lewers Street", you'll find the new "Shore Yard restaurant" that's a trendy bar as well and always busy for dinner. 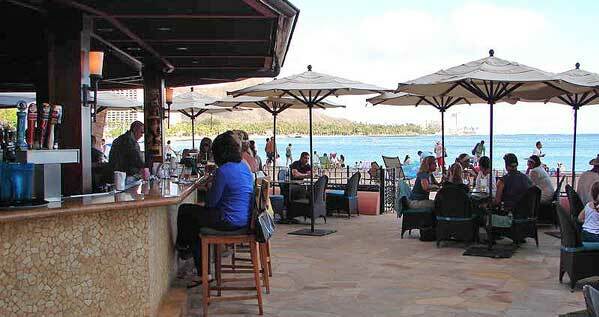 This is currently the hip hangout in Waikiki, and the food is good in a loud, happy atmosphere. Just down the beach walk is Roy's Restaurant, with fresh local fish, meat, and vegetables. There are daily specials with different dishes such as a vegan four course plate that's better than at dedicated vegetarian restaurants. If you want something cheap and cheerful on the beach, try the Shore Bird restaurant. Here, you cook your own seafood and steak, cutting down on staff cost and with a resulting cheaper bill. What makes it a pleasurable Hawaiian experience is sitting overlooking the setting sun right on the northern edge of Waikiki beach, looking all the way down to Diamond Head. And as you look towards Diamond Head, walk down the beach for a famous Hawaiian mahi mahi burger with grilled local fish. You'll also find black Angus beef burgers at Cheeseburger in Paradise on Kalakaua Ave. A Hawaiian guitarist will play any song you like, including the famous Jimmy Buffet song that inspired the restaurant’s name. Best restaurants near Waikik Beach Hawaii are written by dedicated food critics, published and edited by the Best Beach Restaurants editor. Contact Best Beach Holidays to submit your beach holiday articles.